Beaches are great places to find pretty clutter. Here are two sets of shells, limpets and scallops. Limpets have two colours sand and green the scallops have four, two sandy one rose pink and one peachy pink. Both found in clutter for £5. The candles are cloned from the triplet candles that came with Spar Day. 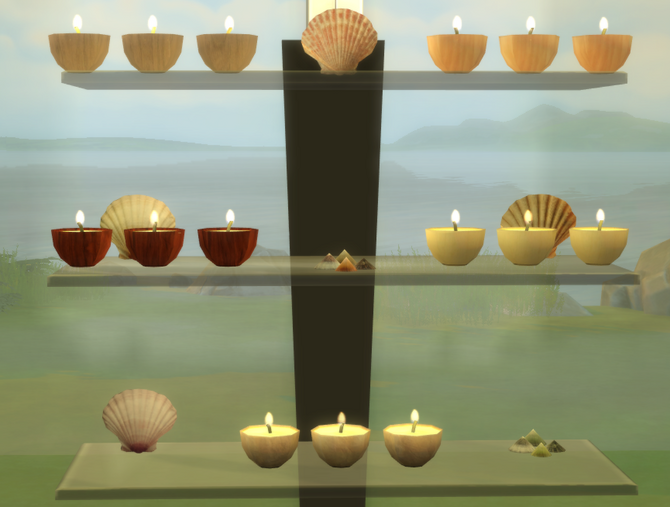 The bases are wood, I thought my sims might have carved a few pots to make beeswax candles. Four wood tones, one marble and one rock. £20 in lightening. All three separate files are in are one zip. 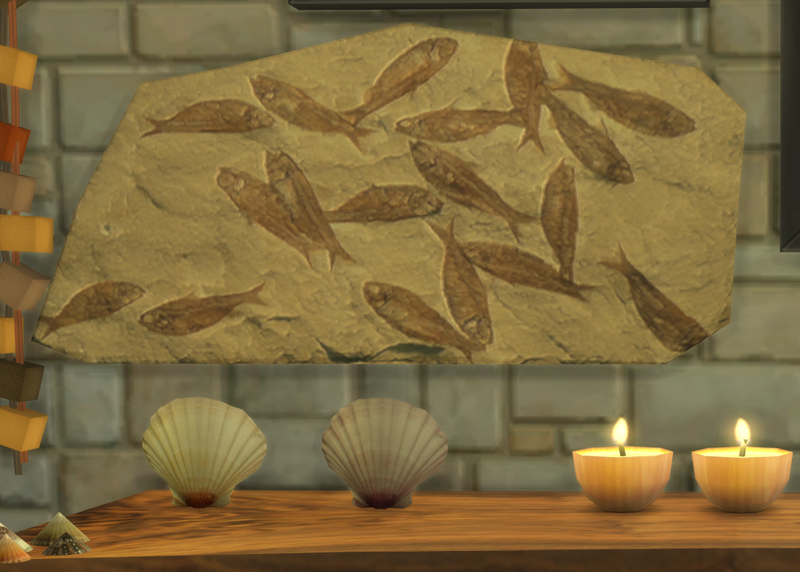 A real fossil fish plaque to add to your fossil collection. 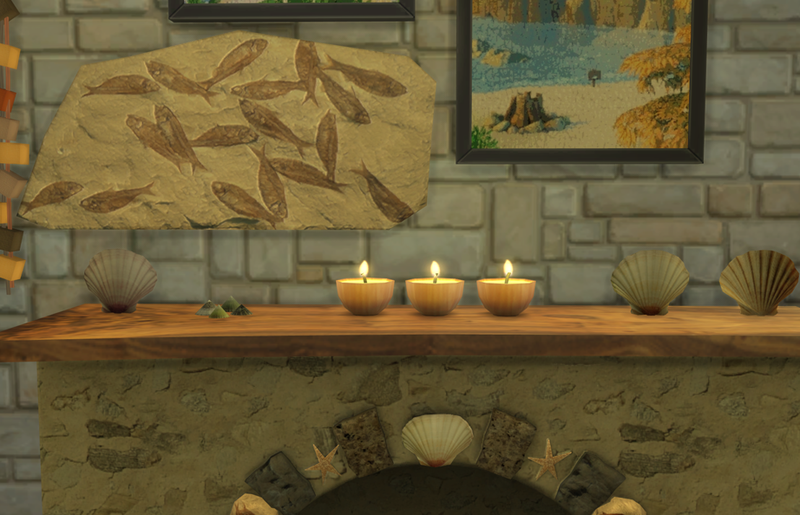 The fish match those on the fireplaces. Found in pictures £150 (because I found that fossils are really big business). A little add for the collectors, three pieces of amber. Great for window sills as they catch the light well, or the lab along with the other bio stuff. The textures are the real thing so one of them does have Jurassic walkers in it. 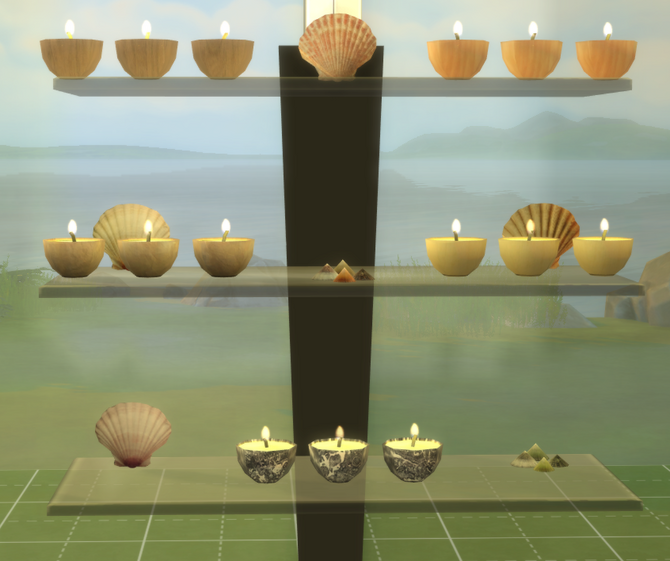 I looked around my place and found that I do this a lot, put crystals and shells around the base of my candles so here some for your Sims. 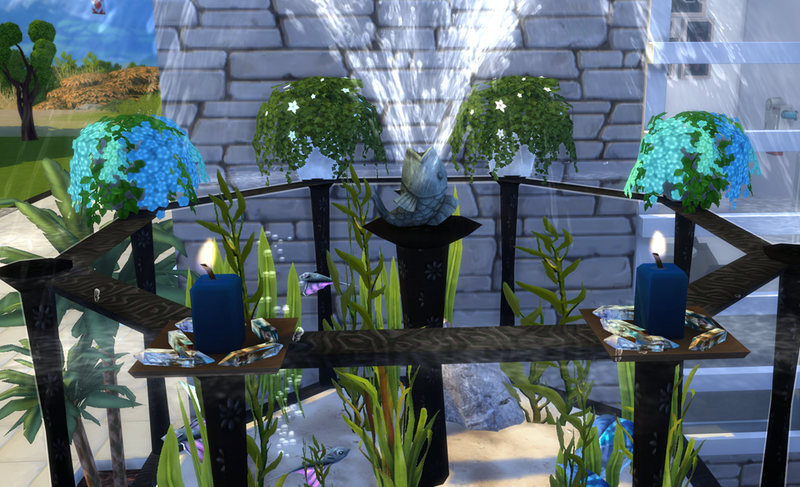 I took these pictures last night after the update so they are working OK. Candle mesh Maxis, crystals me. Made with Sims 4 Studio & Blender. Pics taken in The Shed so all the clutter and stuff is mine. 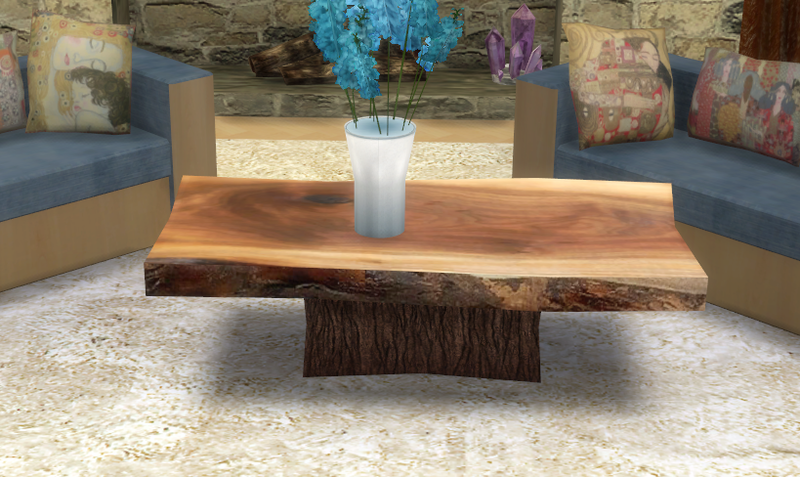 Part of the Summer collector's set, a wood slab coffee table. 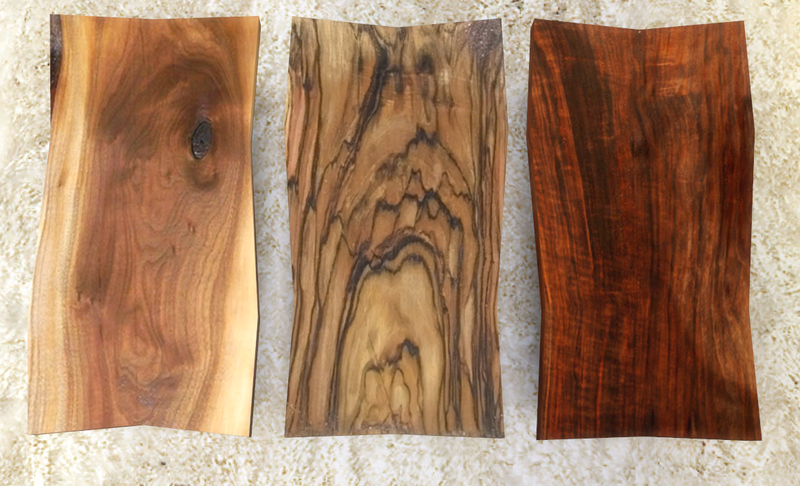 Three different tops and all have bark bases. It just seem to fit with all the other natural stuff I've been making. 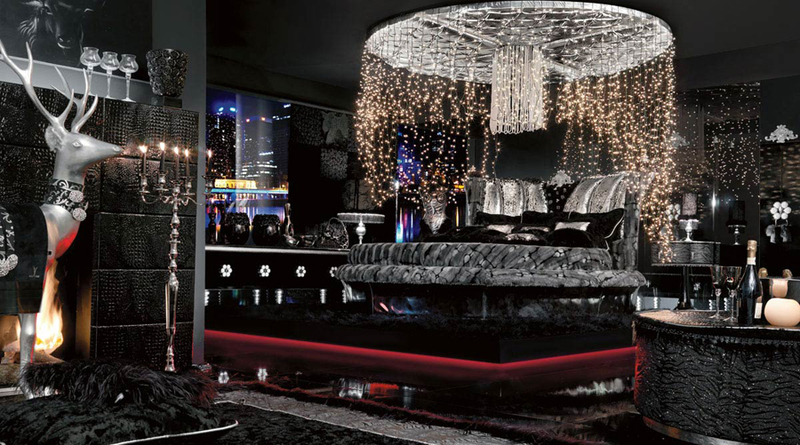 The candles and crystals look good on it :-) Very light, polys 111. Found in surfaces, £100. Will not be put in the toy boxes at all any more. 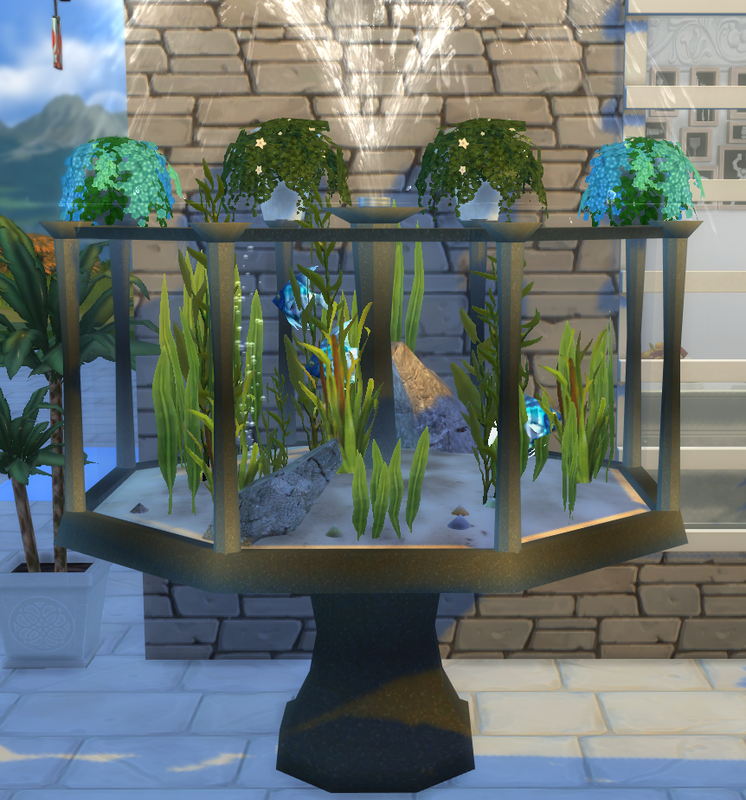 A few days ago I saw a WCIF for a beautiful ornate outdoor tank. I couldn't match the decoration but I could make the shape. 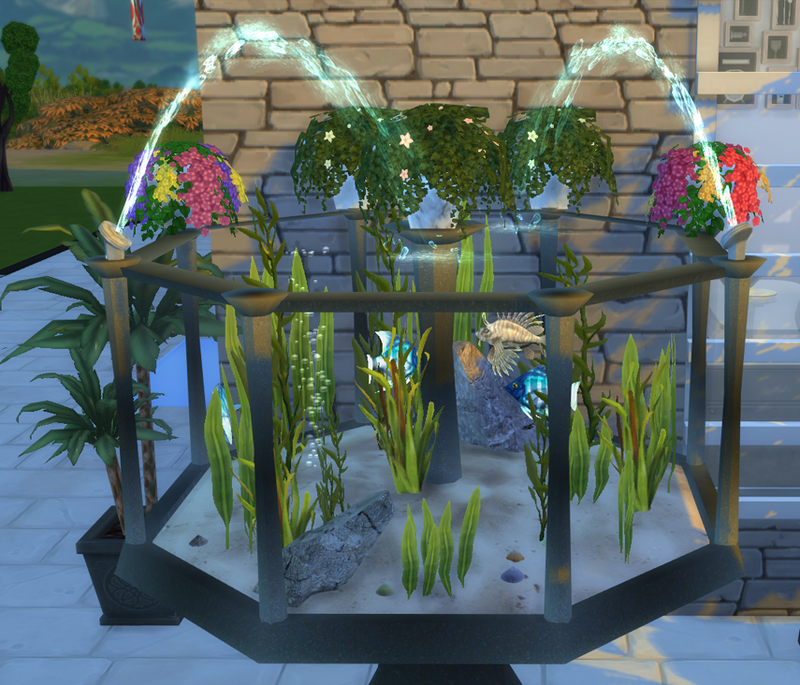 I also added some slots and made some water emitters and flowers to 'Do Different'. 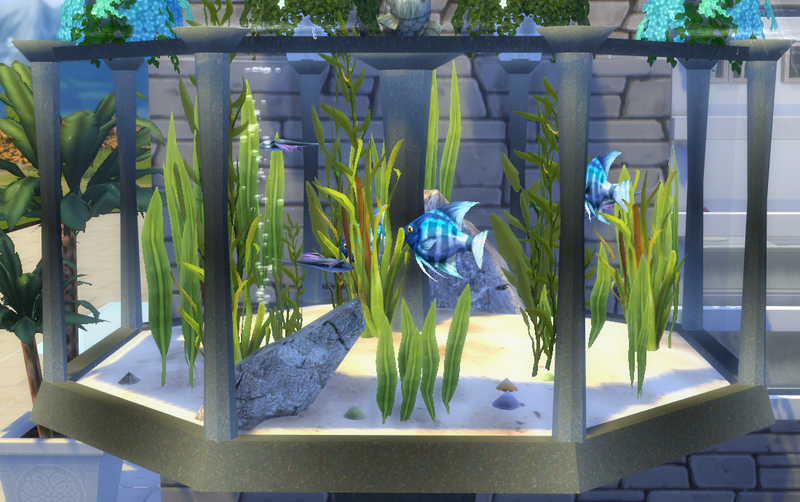 So here they are, two tanks black and gray, with 9 slots around the top. The meshes are a little poly heavy verts-1705, polys 1493. 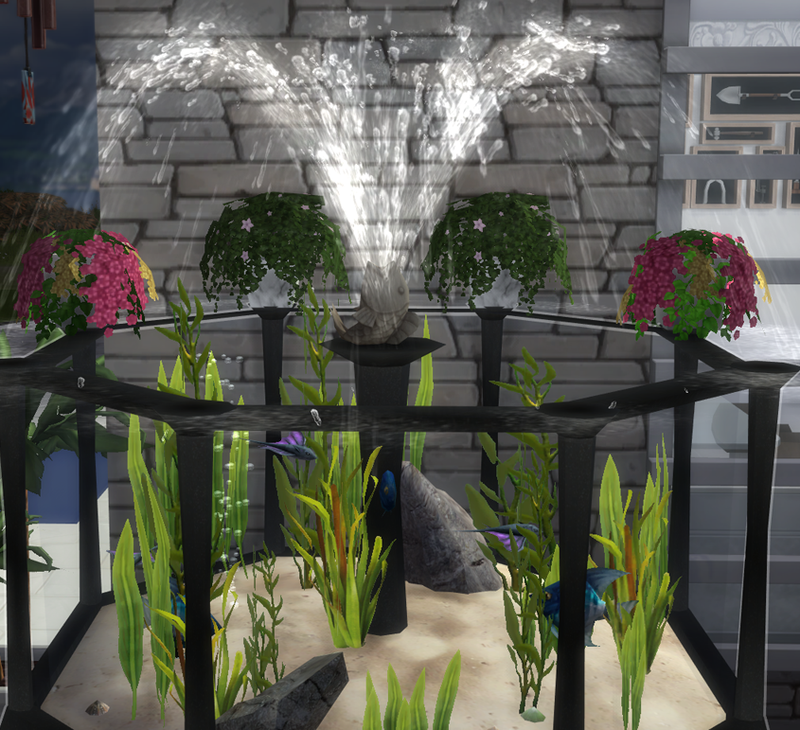 The fountains and water sprays are NOT part of the tank they are in a separate download below this one. They do make a difference to the design which is why I showed them in the pictures. 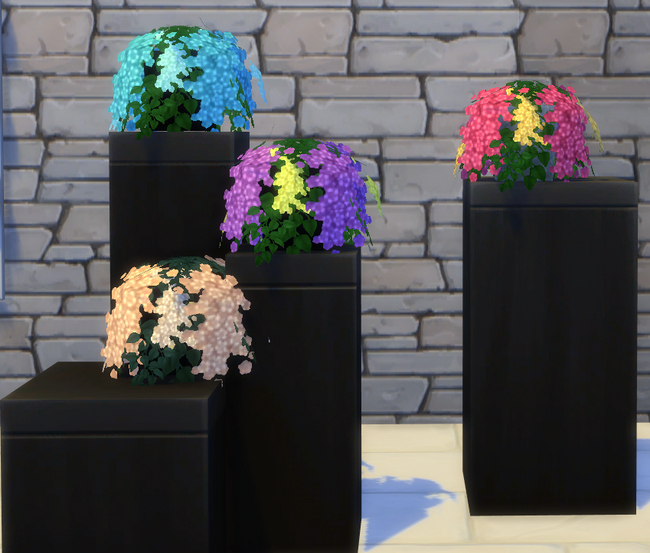 The flowers have also been made to trail a little over the sides and are in separate download below as well. £350 in activities and skills. 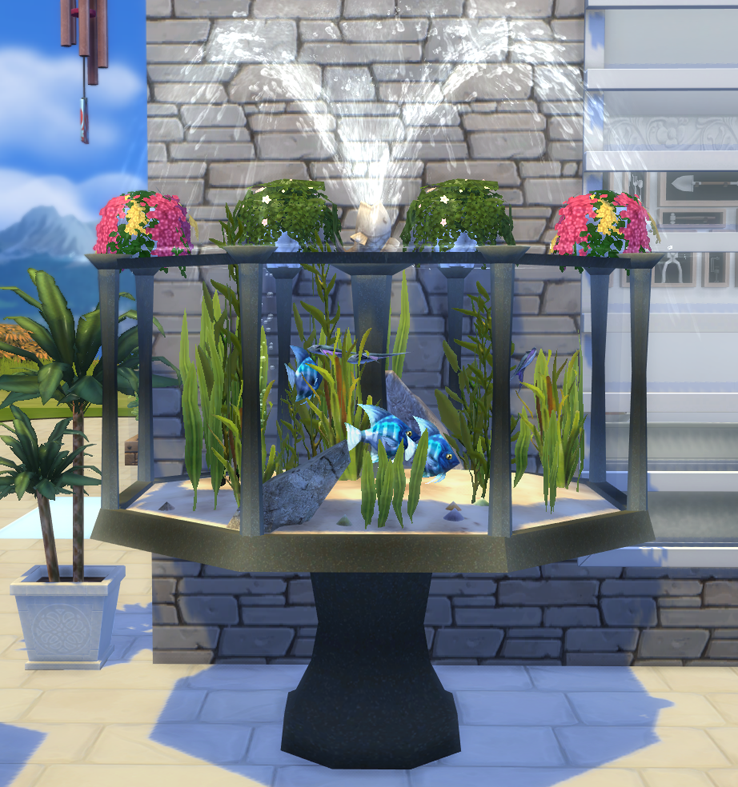 They might make a good outdoor wedding decoration perhaps with all one colour fish and matching flowers. 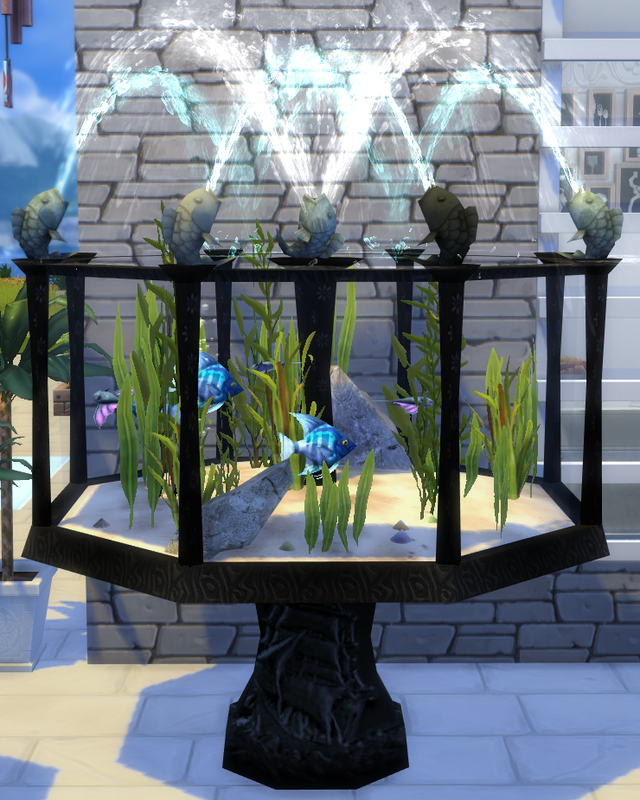 I made 4 small water emitters sit outside fountains so they could decorate the above tank. 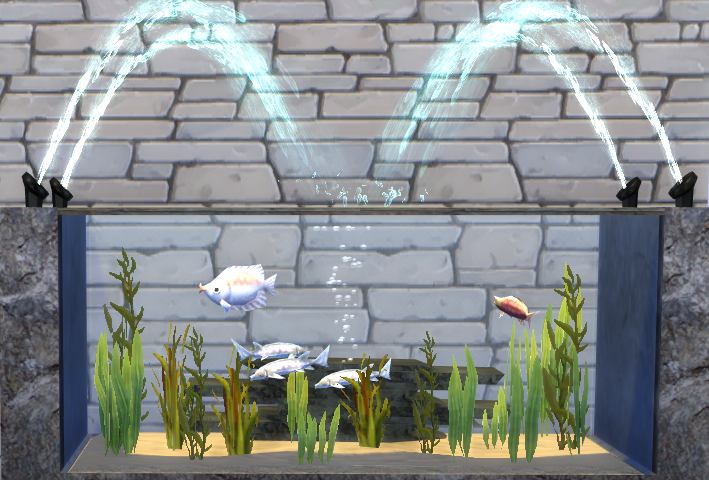 There are 2 ordinary, one dome/fountain and one spray; and two fish, again dome and spray. 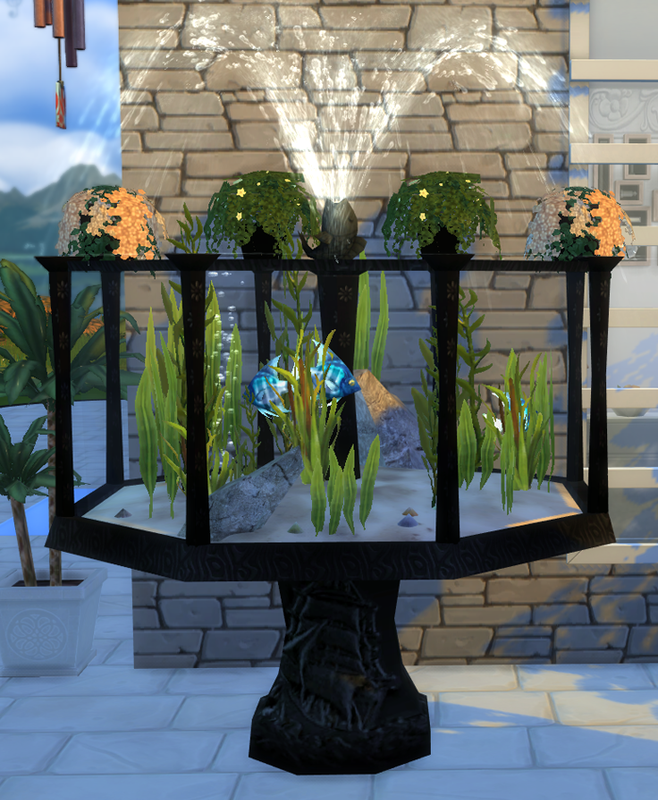 The fountains will sit on the floor, on a slot and in water, but the sprays won't sit in fountain water, they do sit by the side of a swimming pool though. £5 found in fountains. 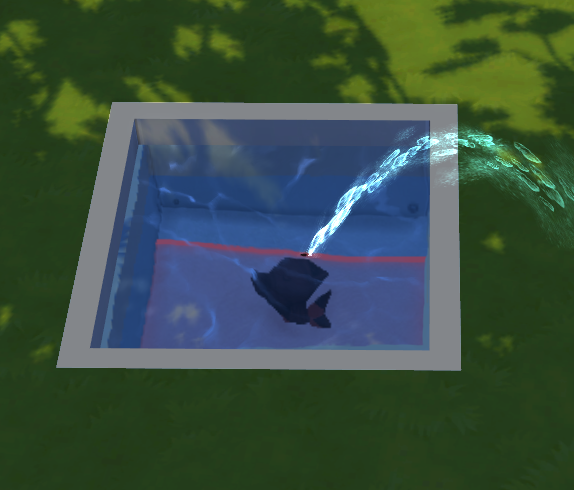 These sprays will no longer sit in the fountain pools (below). 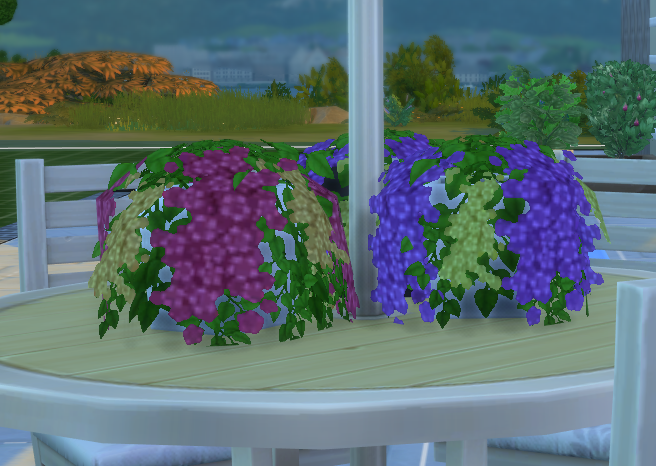 I made these to sit around the edge of the Summer tank, I realised I only had one trailing plant and wanted different colours. I made three colour pots, white, stone and black and used all the colours for each pot. 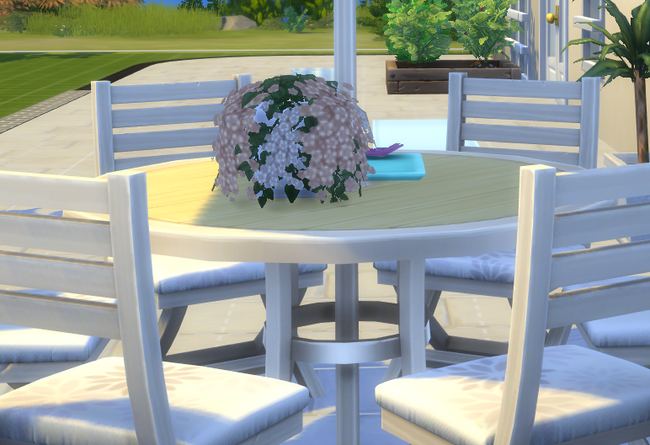 They will sit on tables and flat surfaces but the flowers will sink a little into the top. £15 in plants/deco. I made it for my beach cottages but there are 5 colours and it will suit other rooms. Cloned from the expensive sofa so its base game compatible. Comfort 8, price £350. 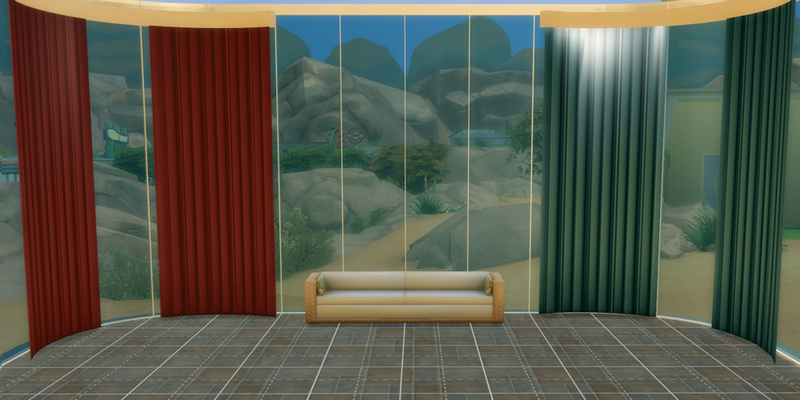 Mesh Maxis, window below by Simista, all other clutter me. 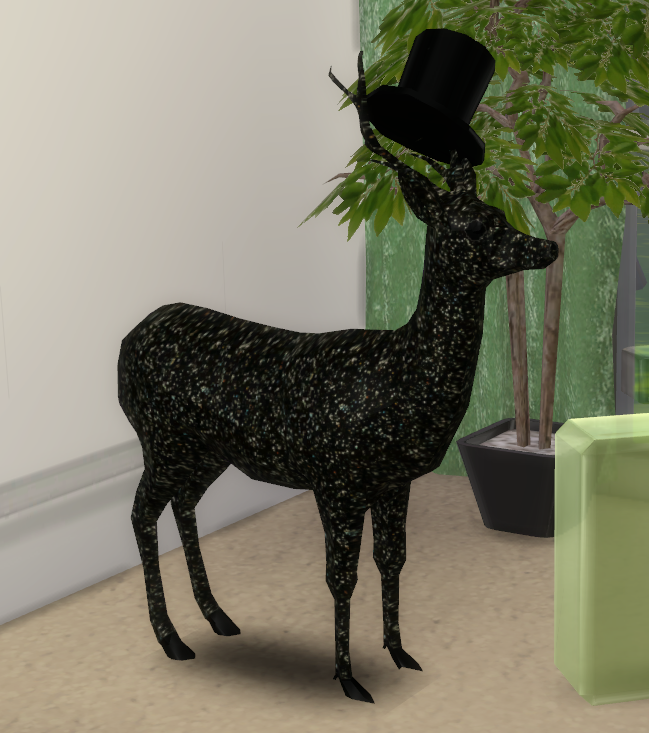 Ivyrose sent me a lovely message which included a request that I make this deer available to download so here it is. Its not perfect and the mesh is not mine I downloaded for free a long while ago. 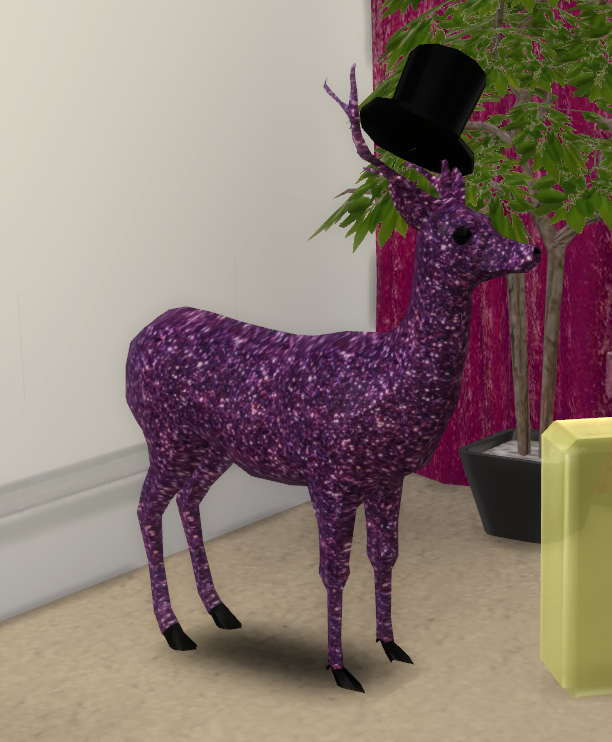 I believe it has been used for the Sims2 a lot and was popular as a non pimped deer. 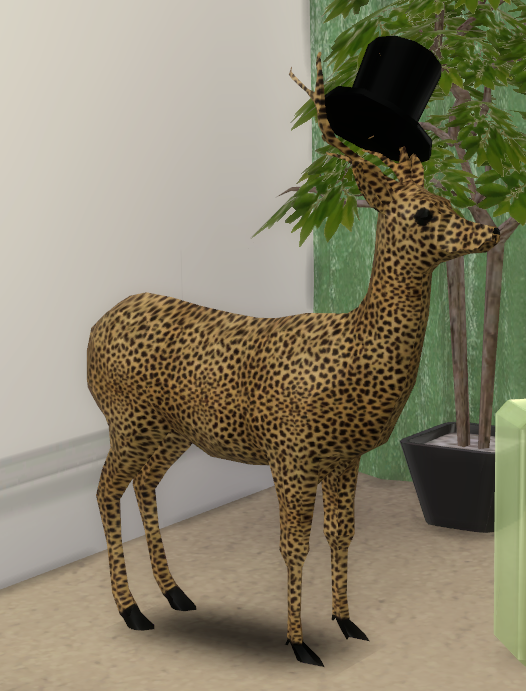 I did this just for fun while making the Goth bedroom, as the picture I was trying to copy had a deer by the fireplace. Never happy with my silver texture I pimped it like this for effect. If it comes in useful I'll be happy. 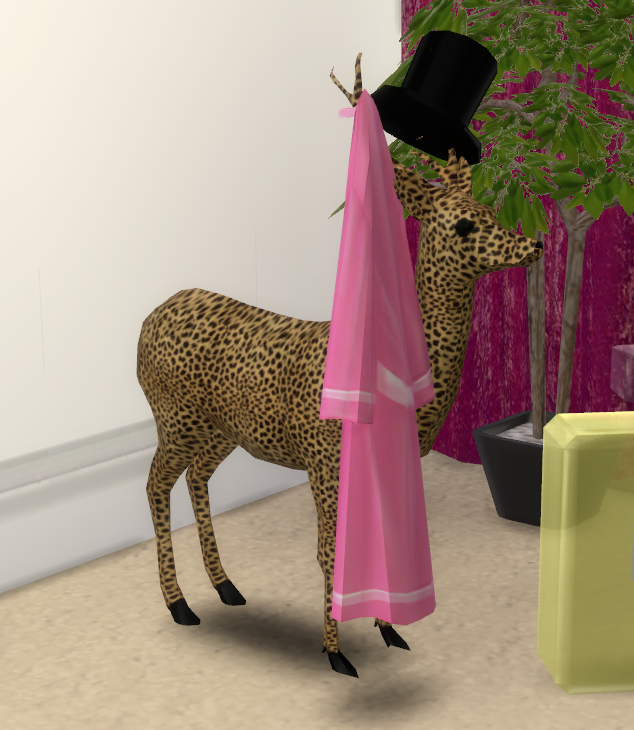 The robe is just the Maxis one made to stand anywhere and I like to hook it on the antlers. I made these ages ago, I've been asked by panuts to re post them so here they are. They are huge and as far as I recall are freestanding. 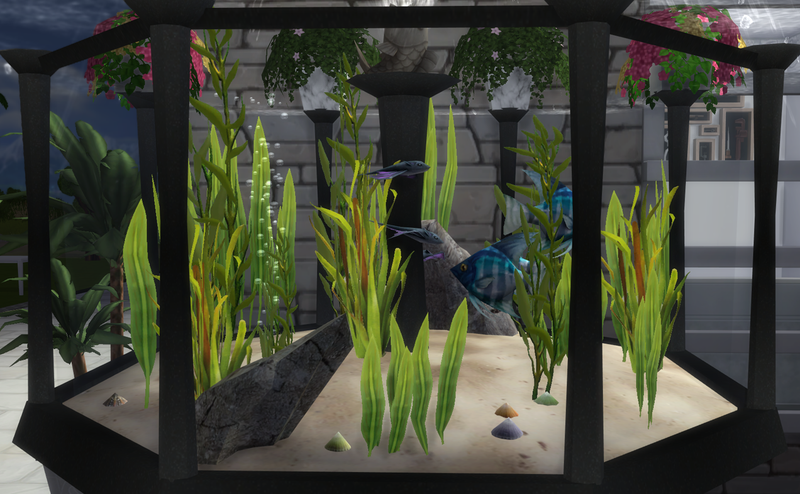 I always liked this bed in the Sims 2 and I finally got around to extracting and converting it. Four cosy colours as its still chilly where I am. It was cloned from the princess bed so it has great stats, but its a great price too- £500. Will no longer be put in the toy box. I made this as an amber pear but I added a few extra colours for fun. Six colours with a glass shader. It is not as transparent as some of my other glass but its pretty. 10 bucks in clutter. 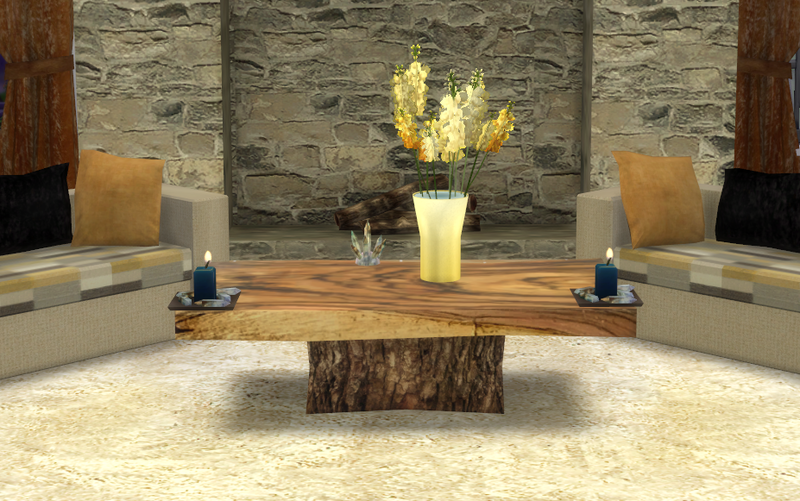 This is another Sims 2 conversion, its a love seat in six colours; Brown/Cream, Black, Blue, Green,Lavender & Pink. I cloned a really expensive base game sofa so its very comfortable. 700 bucks found in Loveseats. Polys 2648.